It’s hard to keep the kids busy during our crazy New England winters. Cabin fever quickly begins to set in after spending only a few consecutive days cooped inside our homes. I always prefer to be out with my kids. For some reason they always behave better outside our home and I don’t have to worry about them destroying my family room. 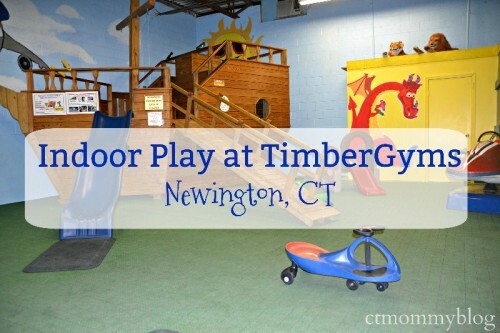 On my quest to find a new place to play I stumbled upon TimberGyms in Newington, CT. It’s the perfect destination for indoor play any time of year. 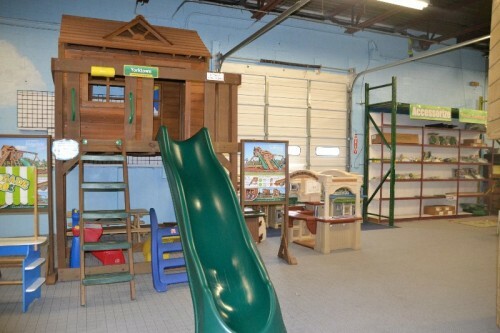 TimberGyms is an indoor play space and playscape showroom. 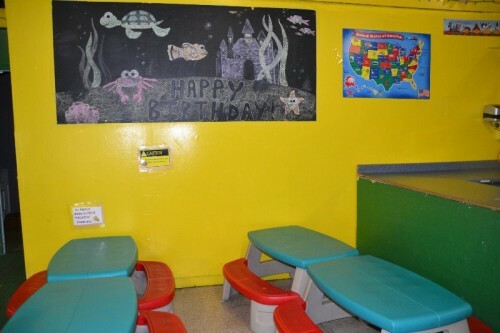 In addition to their playscape business they offer open play and birthday parties. 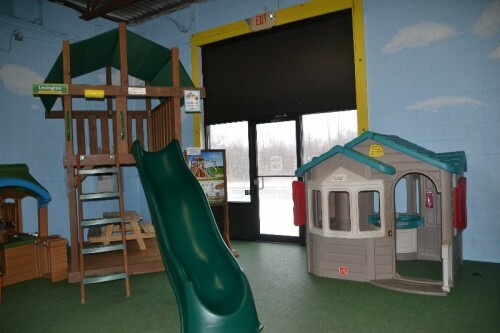 The playscapes in their showroom are for sale and serve as the perfect backdrop for indoor fun during open play hours. It’s open to children ages 1 – 10. 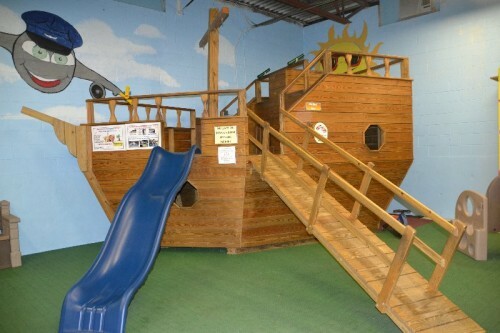 The play space features several large wooden playscapes including a castle and giant ship. It’s a great place for gross motor and imaginative play. The playsets are very impressive and any kid that gets them in their backyard is lucky. 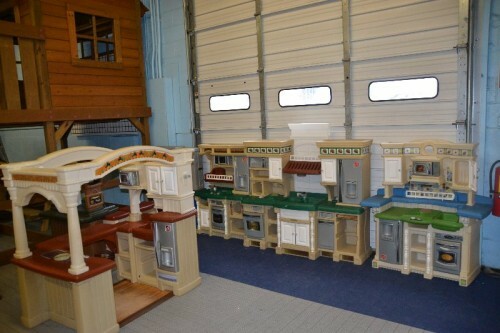 In addition to the playsets, there is a large bounce house, small play areas with kitchens and trains, and riding toys. Open play is open Monday – Friday from 10 am – 4 pm. They are also open on weekends when no events are scheduled. Check their Facebook page for up-to-date times. We visited on a rainy Friday morning and it wasn’t overly crowded but I assume there are more crowds on holidays and weekends. TimberGyms begins a play waitlist during their busiest times. You might want to call ahead during peak times. Price of admission is $7 per child. You can pay in cash or credit. During open play, children are free to explore all of the playsets. Children are required to take off their shoes for the bounce house but keep them on for everything else. TIP: Keep extra pairs of socks in your car or diaper bag. I like that the space is not too large. Having three little ones of my own, I value a space where I can keep track of them running in different directions. There is a small kitchenette that divides the space in half. They have free coffee available for parents (what a nice treat!) and tea/hot cocoa available upon request. There are picnic tables scattered around to enjoy a purchased snack or one from home. Better yet, drive around the corner to Stew Leonard’s for some lunch! TimberGyms offers birthday parties for up to 14 children (additional children can be added for a fee). The basic party package includes 1.5 hours of play time, pizza, cake, drinks, invitations/thank you cards, and paper goods. There is also the option to purchase super party package that includes a magic show, favors, and a treasure hunt. Parties start at $239. I like that the party space is open to the play area. You won’t have to worry about a dozen kids and their parents squeezing into a tiny room. TimberGyms is a fun space for indoor play. 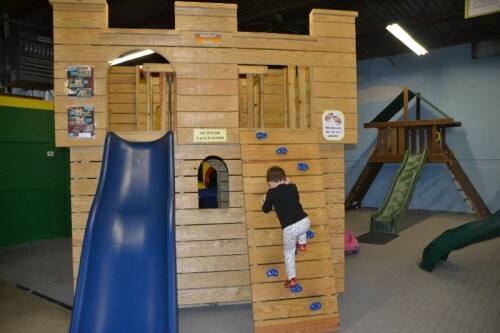 Their large selection of wooden playscapes makes it a unique environment for climbing, sliding, and exploring. I brought my 3-year-old son for open play and he had a blast on all of the equipment. I’d recommend keeping TimberGyms on your list of places to visit this winter. 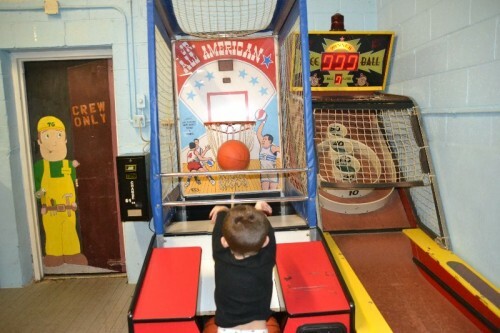 Posted in Connecticut Play Gyms, Family, Family Day Trips, Indoor Play, Things to do in CT. Tagged birthday parties, indoor play, kids gym, Newington CT, open play, playscapes, TimberGyms.